When a prospect from a company lands on your marketing site, members of your Sales team should be able to be notified so as to not miss an opportunity to engage with them and have a greater probability of closing a deal. At the same time, your prospect should be immediately engaged in a customized manner, so they have a message from you there to greet them letting them know you're available to talk. Drift ABM allows for you to send personalized, and targeted messages to the people that really matter. Just upload a list of accounts you want to target with a personalized message and have your sales team start to enjoy prospecting again. Note: this feature is for Premium (formerly Company) or Enterprise plans with the Clearbit add-on. There are two ways to add accounts into Drift right now. We are going to go over Syncing accounts from Salesforce first. To learn how to do a CSV upload of your accounts, read the help doc here. Head to your Accounts tab in Salesforce, and edit your view. The criteria you need to include in your list is: Account Name, Domain, Account Owner. If you do not include this information, the sync will not be successful. From this page, you can sync Accounts from Salesforce! You can also manually add Accounts, import from a CSV, or Drift can send you a suggested list based off of you site visitors over the past week! When you click Sync from Salesforce, you're brought to the Salesforce Sync Settings. Here, you can choose to Force Update All Accounts or add a specific Account List. When you add a list, a window pops up where you can find the correct list in Salesforce! 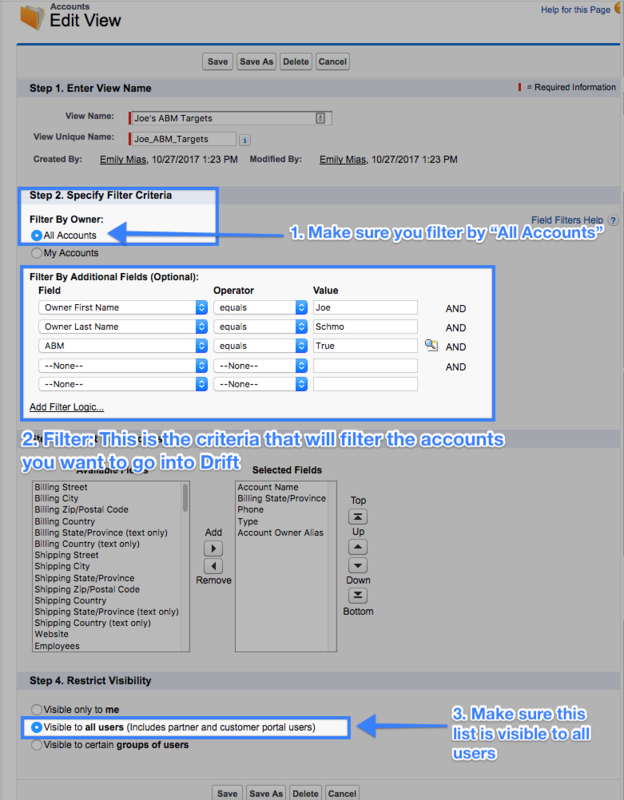 Keep in mind: The SFDC Account Owner sync happens once a night if you change mapped users in Drift to Salesforce. Next, map any Account attributes you'd like to sync into Salesforce. In your Salesforce settings, you can map Account attributes to your Accounts lists to map custom fields. That way, you can maintain existing structures and workflows built around Salesforce for your accounts as well. Each sales rep needs to do this individually in their settings! Head to your Account settings to turn on notifications for your accounts. Towards the bottom of your Notification settings page, you should see the option to "Follow your Accounts". If you turn that option on, you will get a mobile or browser notification (if they are enabled) when your Account is live on your website! 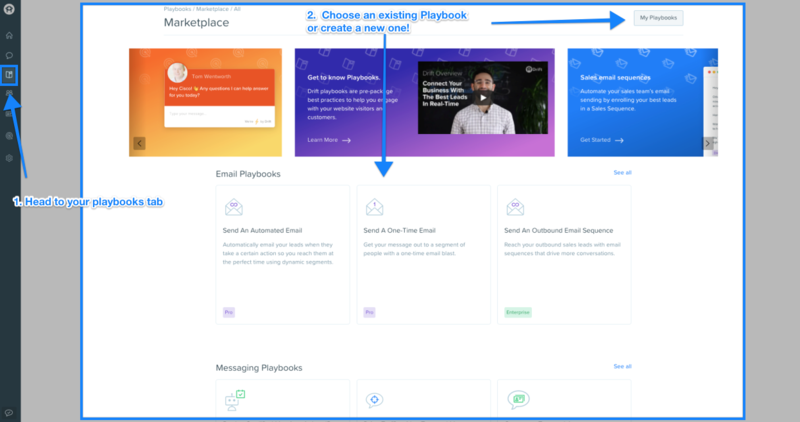 Lastly, set up the ABM Playbook! 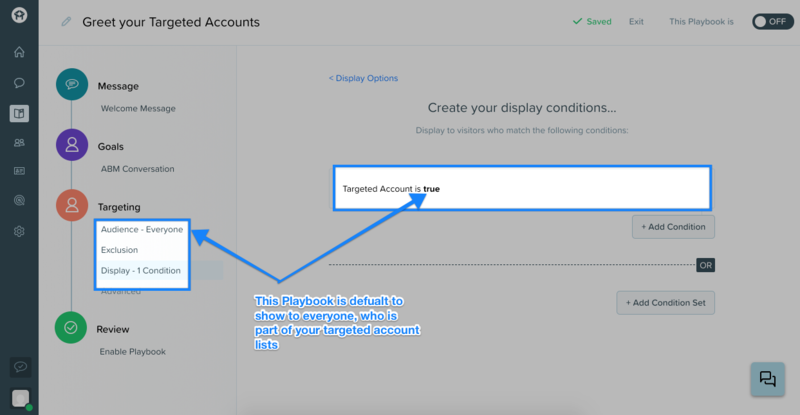 Choose the "Greet your Targeted Accounts" Playbook under Messaging Playbooks. This is where you can customize a welcome message to show your targeted accounts. We drafted one for you that includes the Account Name to make it super personal. 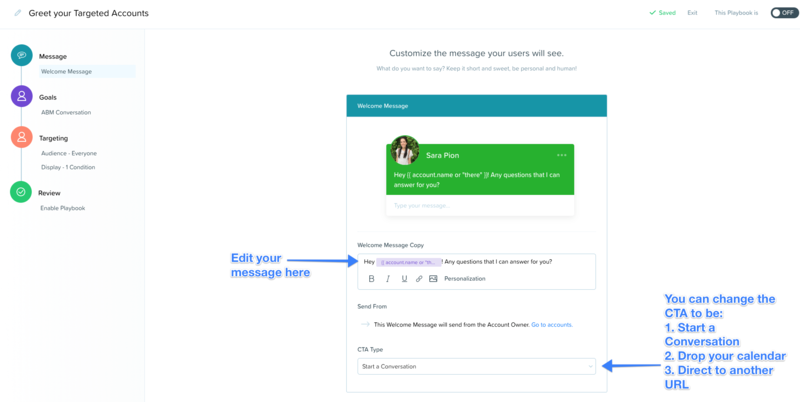 This playbook will automatically put the Account Owner as both the “welcome message” face and route the conversation right to them if the lead responds. 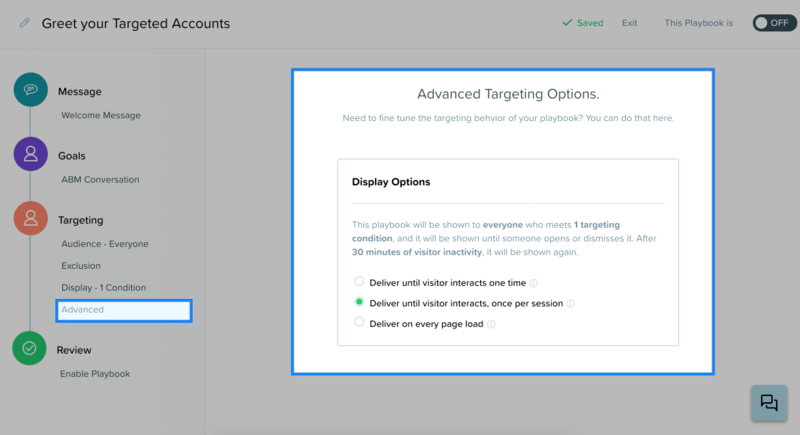 The default targeting settings are set up so that everyone who is part of a targeted account that you've synced to Drift will receive that personalized message. Set your to have your Playbook deliver to your audience once, on every session, or on every page load! Once all of your Playbook settings are up to your standards, you can save your settings, and publish it! The salesforce owner isn't mapped in Drift. This is something you'll need to do in order to make sure the right person is routed to the conversation! Your account doesn't have a website in the website field in Salesforce. You will need to add that as a field and then resync your list.